Perth can get windy at times. Of course, wind is the ideal weather for Kite Surfing. Where is the best kite surfing spot in Perth? Scarborough Beach. I see many kite surfers out there so it must be a good spot! There are a lot of kite surfers by Safety Bay. Looks like a perfect spot. The river by UWA is extremely popular on windy afternoons - travel along Hackett Drive and the kite surfing spot is on your left by J H Abrahams Reserve. 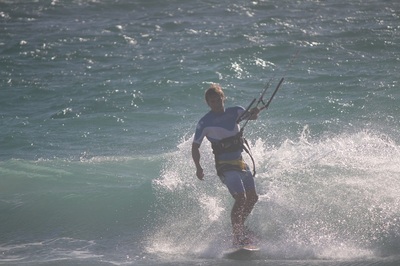 It depends what level kitesurfer you are, if you're a beginner Shoalwater Bay in front of Penguin Island is a great spot, if you're into riding waves then Scarborough is best. For freestylers, anywhere with flatwater such as Woodman Point and the Pond in Safety Bay. Other good spots are Leighton Beach and Pinaroo Point.